Life after college can be a strange, confusing and traumatic wilderness for a lot of graduates to adapt to; when do you have to wake up? Is 4 AM still a good bedtime? Do you have to be an adult and do boring adult things? 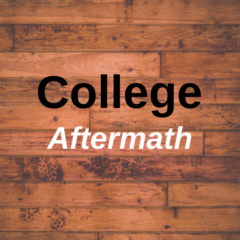 All of these questions and more are enough to make anyone fresh out of college anxious, so in this article are five excellent tips that you need to know if you want to survive life after college. The concept of money, while you’re in college, is quite abstract; your student loan has more zeroes than you have ever seen in your life, yet you are constantly broke. While you are in college, you get used to either having no money at all or spending all of your money straight away on important things like books or happy hour. When you enter the “real world” you can no longer live this way, you need to pay off your student loans, and you need to eat. The only way to do both of those things is to set a tight and unflinching budget for your day to day life. This may seem a little condescending, but it’s true; when you leave college you need to accept that you are now officially an adult, and with that comes responsibilities. If you are ready to realize that changes need to be made to the way you live your life, when you have to confront those changes, it will come as less of a shock to your system. Open your arms to adulthood and be prepared to embrace all of the changes that come with it. A common mistake that is often made by people after leaving college is buying or renting a property because you don’t want to live with your parents. And yes, renting a property is a very adult thing to do, but not when you are fresh out of college. You need to be smart, don’t add to your debt. And even if you want some space and independence there is no shame in staying at your parent’s place. Pay them a reasonable rent and stick to the budget mentioned above. Having to work for a living is one of the hardest parts of being a fully-fledged adult, but harder than that is staying committed to a chosen occupation, especially if you are working for the money and not the career prospects. When you finish college, you might have a concrete idea of what your future holds, but you need a placement holder to earn money. Get a job and even if you figure out that you want to do something else stick with it, collect a steady paycheck and when you are financially able to be out of work for a couple of months, then you can move on. As soon as you get a job, as soon as you get money for your birthday or graduation or even if you find a penny on the floor, you have to save as much as you can! To truly survive life after college you need to start planning for the future, this means a house of your own, starting a family and buying a car. The only way to do that is to start saving straight away; open a savings account and deposit as much money as you can every month. The objective of this article was to let you know that there IS life after college, you just have to smart, frugal and patient. If you follow the tips above your ascent to adulthood will be smooth and easy.